European earth weather satellite. 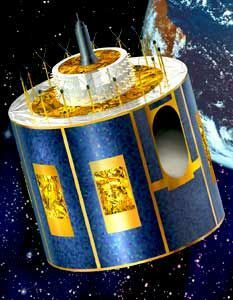 MSG (Meteosat Second Generation 1) was a European (EUMETSAT consortium) geostationary weather satellite. Meteorology satellite built by Alcatel Space for ESA, EUMETSAT, Europe. Launched 2002 - 2015. Status: Operational 2002. First Launch: 2002-08-28. Last Launch: 2015-07-15. Number: 4 . Gross mass: 2,000 kg (4,400 lb). The 3.2m diameter cylindrical satellite had a dry mass of about 1000 kg and carried about 1010 kg of propellant. MSG was to allow quicker and more accurate weather forecasts in Europe than in the past. It carried two major instruments. SEVIRI (Spinning Enhanced Visible and Infra-Red Imager) was a 12-channel imager that was to provide a set of surface and cloud-cover images every 15 minutes at a spatial resolution of 1 km. Four of the channels were in cloud- and soil-reflected visible wavelengths, four infrared channels were to measure temperature of clouds and sea-surface, and the remaining four infrared channels were to provide water vapor, ozone and carbon dioxide contents. GERB (Geostationary Earth Radiation Budget) measured the radiation coming from the Sun and the reflected/emitted radiation from the Earth to obtain the radiation balance. Raw data from both instruments was directly downlinked to Darmstadt, Germany. The processed data was to be uplinked to the same satellite to be rebroadcast to Europe and other regions. The satellite also carried receivers for weather-data from remote/mobile sites, and a 406 MHz transponder for search-and-rescue SOS operations conducted by the global COSPAS-Surat organization. Family: Earth, Earth weathersat. Country: Europe. Engines: S400. Launch Vehicles: Ariane 5, Ariane 5G, Ariane 5ECA, Ariane 5GS. Launch Sites: Kourou, Kourou ELA3. Bibliography: 2, 552, 554, 11477. 2005 December 21 - . 22:33 GMT - . Launch Site: Kourou. Launch Complex: Kourou ELA3. LV Family: Ariane 5. Launch Vehicle: Ariane 5GS. Meteosat 9 - . Payload: MSG 2. Mass: 2,034 kg (4,484 lb). Nation: Europe. Agency: Eumetsat. Manufacturer: Alenia. Class: Earth. Type: Weather satellite. Spacecraft: MSG. USAF Sat Cat: 28912 . COSPAR: 2005-049B. Apogee: 35,793 km (22,240 mi). Perigee: 35,779 km (22,231 mi). Inclination: 1.50 deg. Period: 1,436.10 min. Delayed from mid-February, March 15, June 2005. Meteosat Second Generation spin-stabilized weather satellite. As of 2007 Mar 10 located at 0.11W drifting at 0.024W degrees per day..
2012 July 5 - . 21:36 GMT - . Launch Site: Kourou. Launch Complex: Kourou ELA3. LV Family: Ariane 5. Launch Vehicle: Ariane 5ECA. 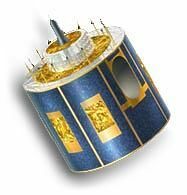 Meteosat 10 - . Payload: MSG 3. Mass: 2,000 kg (4,400 lb). Nation: Europe. Class: Earth. Type: Weather satellite. Spacecraft: MSG. USAF Sat Cat: 38552 . COSPAR: 2012-035B. Apogee: 35,787 km (22,236 mi). Perigee: 35,784 km (22,235 mi). Inclination: 1.70 deg. Period: 1,436.00 min. Third Meteosat Second Generation weather satellite..
2015 July 15 - . 21:42 GMT - . Launch Site: Kourou. Launch Complex: Kourou ELA3. LV Family: Ariane 5. Launch Vehicle: Ariane 5ECA. Meteosat 11 - . Payload: MSG 4. Mass: 2,000 kg (4,400 lb). Nation: Europe. Class: Earth. Type: Weather satellite. Spacecraft: MSG. USAF Sat Cat: 40732 . COSPAR: 2015-034A. Apogee: 35,793 km (22,240 mi). Perigee: 35,780 km (22,230 mi). Inclination: 2.94 deg. Period: 1,436.11 min. Meteosat Second Generation (MSG) 4 ; redesignated Meteosat 11 once in operation with EUMETSAT, the European Meteorological Satellite Organization. Geosynchronous orbit stationed at 03.5W.